ANTANANARIVO, Madagascar – “I used to tell young people to stand up for their ideas,” said Tiana Razafinimanana, in Antananarivo, the capital of Madagascar. Today, she is not only helping the country’s young people express their ideas – she is helping to make those ideas a reality. Today is International Youth Day, which focuses this year on the civic engagement of young people. As in many countries, young people are Madagascar’s greatest untapped resource. A third of the country’s population is between 10 and 24 years old; if fully empowered, they could be an engine of productivity and progress. 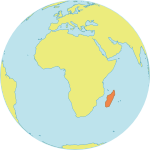 But Madagascar’s youth face considerable hurdles, including limited access to education and training, poor access to reproductive health information and care, lack of decent jobs, and insufficient representation in decision-making processes. Girls and young women face even higher barriers to empowerment. Child marriage remains prevalent, and adolescent pregnancy rates are high. About 147 girls give birth out of every 1,000 girls aged 15 to 19 – almost three times the global adolescent birth rate. No one knows more about these challenges than young people themselves. Ms. Razafinimanana runs Youth First, an organization dedicated to training a new generation of leaders to address these challenges, with a special focus on empowering young women. “As we always say, young people need to take the lead,” she noted. Ms. Razafinimanana started Youth First in 2011, when she was 26 years old. She and her partners launched the organization using sheer willpower and ingenuity. “We started without financial resources, capitalizing on the expertise and know-how of our members,” she said. Their determination has set powerful example for those they help. “Sometimes young people expect funding from a donor before starting a project. However, they can succeed by mobilizing and investing their knowledge and time,” Ms. Razafinimanana said. In 2014, Youth First won the Innovative Project for Youth Contest, organized by UNFPA and the Ministry of Youth and Sport. UNFPA then began to support the Young Women’s Leadership Programme (YWLP), one of Youth First’s many projects. 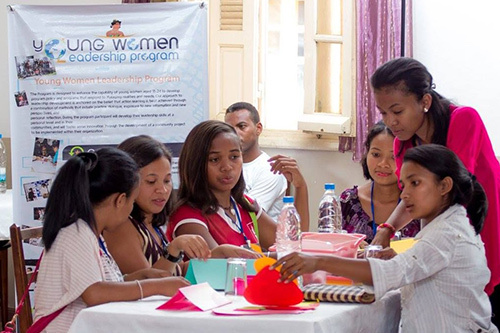 YWLP is a four-month programme designed to cultivate women leaders. It trains women, all between the ages of 18 and 24, in advocacy, project management and resource mobilization. YWLP helps each participant identify concerns in their communities and then develop projects to address those issues. The five strongest projects receive funding from Youth First. Iriana, 24, developed a project to improve girls’ reproductive hygiene. In Madagascar, menstruation is a taboo subject, and girls often lack basic information about their bodies and health. Iriana’s project tackles the issue head-on, teaching girls about menstrual cycles and how to make washable sanitary pads. Her project was selected to receive funding. It will be implemented for 25 girls at a rehabilitation centre just outside Antananarivo. “I convinced the jury that my project could help vulnerable girls to be healthier,” Iriana said. YWLP is now growing. 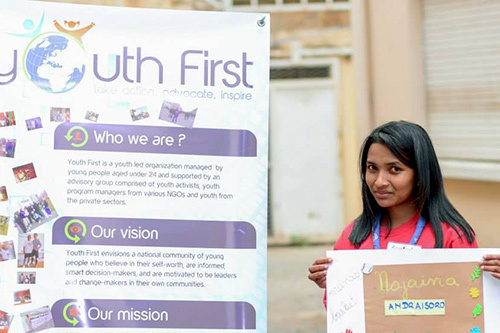 In late 2014, with UNFPA support, Youth First held a ‘training of trainers’. Each of the graduating trainers will be able to implement YWLP in a different part of the country. “Our actions are intended to reach out to all young Malagasy,” Ms. Razafinimanana said. Meanwhile, YWLP’s former participants have remained active in their communities, working to advance the welfare of young people.